Family in Weaverville replaces their old filtration system with our Made In USA system. They decided to go with a three filtration system. 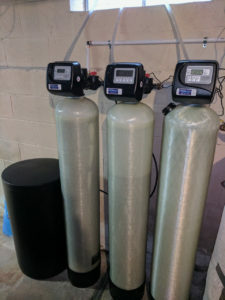 They purchased a water softener for hard water issues, and a neutralizer for pH balance issues and a carbon filter to purify the water. This was a huge upgrade and investment! But it was will worth it. The water tastes a lot better and has no nasty smell. But the main reason is that they are protecting the new dishwasher and washing machine that’s fairly new. Not only that! This filtration system they bought from Mountain Water Systems protects the pipes!